Took a wee jaunt up Ben Tirran on sunday and as I was coming back around the snub above Loch Brandy I noticed what looks like a causeway cutting across the southeast corner of the loch. At first I thought it was maybe just the a small ridge under the water but there looks to be built remains above the water line as well. Could anybody shed any light on why such a small causeway, maybe 10-20m or so would be built over such a small corner. it doesnt go from anywhere, to anywhere and i would guess would save you about 2 minutes from walking around the edge. my only wild guess would be something to do with keeping fish in one area??? It also reminded me of Muriel Grays munro book where she talks of seeing what looks like a crannog at the lochan of Sgurr an Lochain on the South Glen Shiel ridge. anybody else uncovered any archaeology from the high views of the hills? I took this pic when up there recently and mulled over the very same question in my head, (it can be seen just below the water here) I eventually decided that as the water runs out of the corner where the curved causeway is, perhaps it is there to maintain a certain water level in dry times as the run out corner does look low compared to its surrounding banks - could be totally wrong though, it just seemed logical at the time. I realise this thread has been dead for a while. 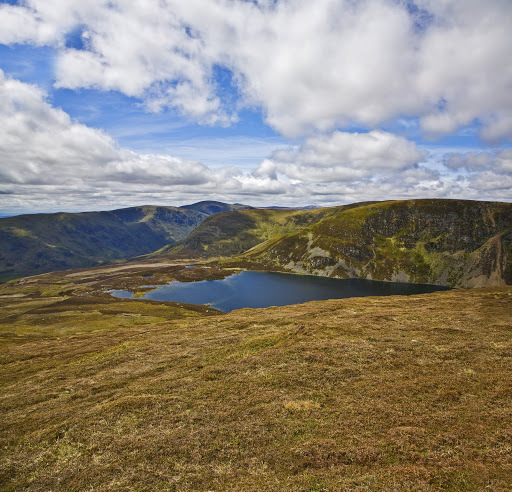 I have recently been working on research to do with the glacial history of Loch Brandy. I have interpreted The Causeway as a pro-glacial recessional moraine during the LLS stillstand or later deglacation/decay period (possibly ~12.4kya). One presumes the moraine was then modified and used later when Clova was populated, most probably for brown trout fishing. Although The Causeway is extremely well-molded, it seems like a pointless and mammoth task to build it. I wondered what your opinion was and whether you had much knowledge of the glacial history of the area? I,ll not pretend to understand half of that but as coincidence would have it i was speaking to somebody the other day who said there was brown trout in loch brandy. i dont know if that helps or not. I know corrie fee just a couple of miles up the road has plenty evidence of glacial debris and moraines but thats about the sum of my knowledge. try getting in contact with the angus ranger service they might be able to out you on the right track.